Three Chrysler Imperial Parade Phaetons were produced in 1952 by Chrysler as ceremonial vehicles. They were styled by Virgil Exner and were in many ways a preview of the new "Forward Look" styling that would debut in 1955 on the newly separate Imperial marque and on other full-size Chryslers. The cars were based on stretched (to 147.5 in) 1952 Imperial Crown Limousine chassis and carried completely custom bodywork with the exception of the 1951 Imperial grille, bumpers and front and rear trim. Almost uniquely for a postwar car, they were dual-cowl phaetons, with separate front and rear passenger compartments, each with its own windshield. There were no side windows, and the flimsy lightweight Dacron convertible top covered only the rear compartment. It retracted fully beneath the rear-hinged deck lid when not in use. The rear doors were suicide doors and had no exterior handles. Under the custom bodywork, the mechanicals were standard top-of-the-line Chrysler for the period, with a 331 cubic inch (5.42 L) FirePower V8 engine, torque converter transmission, and power steering. Three cars were built. One was for New York City, the second for Los Angeles, and the third was intended to be a gift to the White House, but the gift was refused as against the then rules for receiving gifts. Instead, the third car was nominally based in Detroit and was used around the country. The cars continued to be owned and serviced by the Chrysler Corporation. After three years of service, the cars were brought back to the factory in 1955 to be updated to 1956 Imperial appearance, in which form they continue to exist to the present day. The front and rear, including grilles, bumpers and trim, were replaced. Internally, the engines were updated with 4-barrel carburetors, and fully automatic Powerflite transmissions were installed. The cars were all repainted. After the rebuild, the cars were donated to the respective cities. A revival was introduced by Chrysler as a concept car, called the Chrysler Phaeton in 1997. The Apollo 11 astronauts ride in New York's Chrysler Imperial Parade Phaeton in a ticker-tape parade. The New York car was originally painted in black with a grey interior. In the 1955 rebuild, it was repainted off-white with a red interior. It must have been repainted in black again before the August 11, 1969 Apollo parade as evidenced in the photo above. The car remains in the possession of the City of New York, and was rebuilt in the early 1980s. At this time, it was repainted in black again, but retained the red interior. The Phaeton is still occasionally used for official functions, parades and ceremonies. It has carried many dignitaries, celebrities and notables over the years, including the Apollo 11 astronauts. 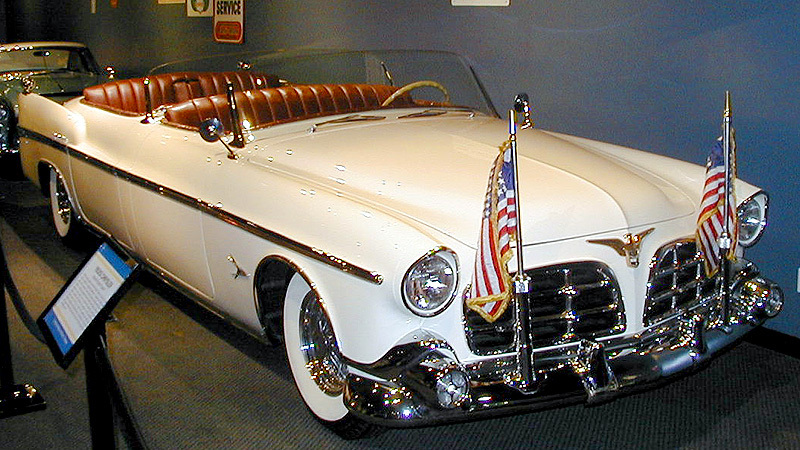 The Los Angeles car was painted cream with a rose interior, and was first used in the 1953 Tournament of Roses Parade. It was subsequently used up and down the West Coast. In its 1955 rebuild, it was repainted metallic silver-blue with an off-white interior. It can be seen in that form in the 1959 film of the Broadway musical Li'l Abner, transporting the "General Bullmoose" character. It was later restored and repainted white, retaining its off-white interior. The interior was more recently replaced in red leather. It is still in the possession of the City of Los Angeles and takes part in official parades and celebrations. It was apparently the Los Angeles car that was featured in the 1987 Charles Bronson film Assassination. It also made an appearance in the 1960 Jerry Lewis film Cinderfella. The car was also used as Victor Mature's limousine in the Allied Artists production "The Big Circus" . The Detroit car was originally painted in a metallic green with a natural pigskin interior, and was used in events around the country. It was repainted in desert sand with a red interior in its 1955 rebuild. This Phaeton was sold and ended up in private hands, becoming part of Paul Stern's collection for some time before being sold to the Imperial Palace collection in Las Vegas, Nevada where it was displayed for many years. In 2001, with the mass of the Imperial Palace collection being broken up, it was sold to Robert Petersen and is now on display at the Petersen Automotive Museum in Los Angeles. The car is currently in white with a red interior. ^ "Your Ride Has Arrived for the Ticker-Tape Parade". Retrieved 2018-07-30. This page was last edited on 17 November 2018, at 01:29 (UTC).